P.E is on Monday and Tuesday. This week we have been settling into Year 3 and learning about our new year group. We have done some writing about our Summer holidays and have been completing maths challenges. We also created recipes for success in Year 3! We included determination, sensibility, perseverance and kindness! Here is Lukasz's. This week we have been working on how to present our work in books. We have been discussing our goals for year 3 and what we want to achieve. We have also been looking at the book Window. We described what we could see out the different windows and discussed what differences we could see as the story went on. We then designed our own window and described what we could see. Ryker designed an under water themed window and then described the 'scary, white shark'. We also have been learning how to build 3D shapes using nets! 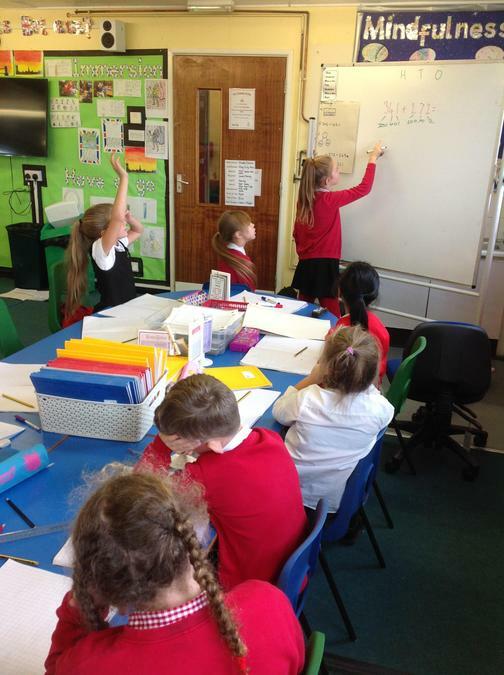 This week we have been learning about place value in maths. We have learnt the value of each digit in a three digit number and how to show these using different representations. We have also learnt how to write these numbers in words. We have learnt how to find 10 more and 10 less of a 3 digit number using place value grids and base 10. In English we have the Queen's Hat and we have described the key London landmarks, written diary entries as if we were queen and we have written questions we would like to ask the Queen if we were to meet her! We also learnt some interesting information about the River Thames and the children wrote some brilliant fact files! Did you know it is 388km long?! In art, we used nets to build Big Ben. This week we have been learning about King John! We have discovered that he is a terrible person as he killed his nephew and his friend's family!! We have been practising using coordinating conjunctions in our writing; FANBOYS (For, And, Nor, But, Or, Yet, So). This week in maths we have been ordering and comparing numbers. We have been investigating more than and less than and have been using different representations of numbers to challenge ourselves! This week we have also been baking a famous British dish; scones! We have continued with comparing and ordering numbers this past week and we have been practising our reasoning and problem solving skills. We were able to fill in missing gaps to make statements true and solve word problems too! In English we have been learning about Queen Elizabeth the First! We have been extending our vocabulary through this topic. Trewon - "instead of she ate a lot we could say that she had a big appetite. " We even wrote a letter to Queen Elizabeth the first to explain why we were the perfect prince for her! Josh - " I would be a good prince because I would cook her fine, royal dinners!" This week we started our addition topic! We started by looking at adding ones to numbers with 2 and 3 digits. We have been developing our reasoning skills and aiming to use the word "because" to explain why something happens. Cassie "342 + __ = 34__... I can't put more than 7 as that would then change my tens digit"
We have also been learning how a number line can help us to add 2 digit numbers, we will be developing this into 3 digit numbers next week! In English we have been doing all things Shakespeare! We have read A Fairy Song, Blow Blow Thou Winter Wind and Shall I Compare Thee to a Summer's Day! We created our sonnets and learnt that every other line rhymes apart from the couplet at the end! Josh and Lily's won themselves a book award! The children did extremely well to discover the meaning of some shakesperian language! Cameron: Shakespeares has said the wind has a sharp bite as when it's cold it can give you shock! 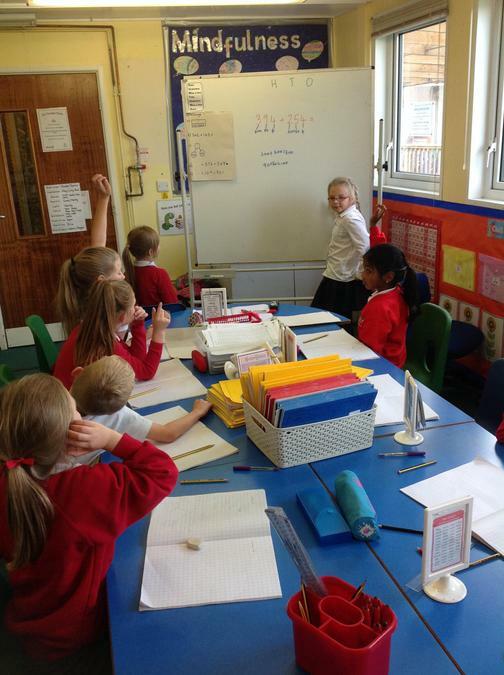 This week we have been learning how to add on a number line! We have used our knowledge of adding 10 and 100 and have been able to add 3 digit numbers successfully! We also drew number lines on the playground when explaining what to do and why with our partners. This week we have been learning to add using partitioning! We have been investigating different rules and how to overcome some barriers. Year 3 have been having a go at peer coaching and helping their class mates! We all enjoyed a brilliant harvest festival and made some excellent scare crows using a paper plate! Thank you to all the adults that came in to enjoy the festival with us! Have a safe and enjoyable half term and we will see you ready for our term 2 adventures! Miss Pring, Mrs Parker and Mrs Hinse.